We are getting down to the wire when it comes to Christmas knitting. Every year I tell myself I won't knit anything for Christmas, or that I will knit something earlier in the year and save it for Christmas. And every year I find myself doing last-minute calculations a week before Christmas in despair. The best favor you can do yourself is to be honest. As I write this, we still have ten days left. That seems like a lot of time, but don't be fooled. Take a minute to figure out how many days you have been working on your project, and how many hours you have spent knitting it. That will tell you how much time per day you have been averaging so far. Now take a hard look at your project and be honest with yourself: how much more is left? This will tell you whether or not it is reasonable to assume that you will be able to finish before Christmas. I know that some very high-profile knitting bloggers like to make a big to-do every year about how silly they were to over-commit to a project, and how impossible it is that they will be able to finish in time, and yet every year they manage to finish. Don't follow in their footsteps: it's unrealistic, and it will only make you crazy. That is the kind of thing that makes for good blogging, but is not helpful for sane people who want to enjoy a rational holiday that is as stress free as possible. You already have plenty of stress in your life, yes? Why make it worse for yourself? If your estimates lead you to believe that you will finish on time, then get to it! If you want. If you want to cut yourself some slack and finish the gift after Christmas (or never), I personally will not judge you. 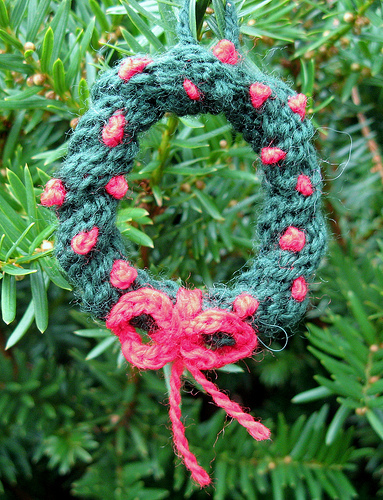 Remember: there is no law that states a knitter has to give a hand-knit gift for Christmas. Frankly, a lot of people would rather have an Amazon gift certificate. This is the second and final hard truth: a lot of people just aren't worth the effort. They won't see the dozens of hours of time you poured into your offering. They will just see "yet another pair of fingerless mitts that I never wear anyway." Know when you're beat. Take care of yourself first. And remember, if someone is truly worthy and appreciative of your knitting as a gift, they will be fine with getting a "knitting IOU" for Christmas!